In Week 1, I began with an empty room and shared the plan and some inspiration photos. Week 2, saw the addition of the key pieces of furniture and general room layout. 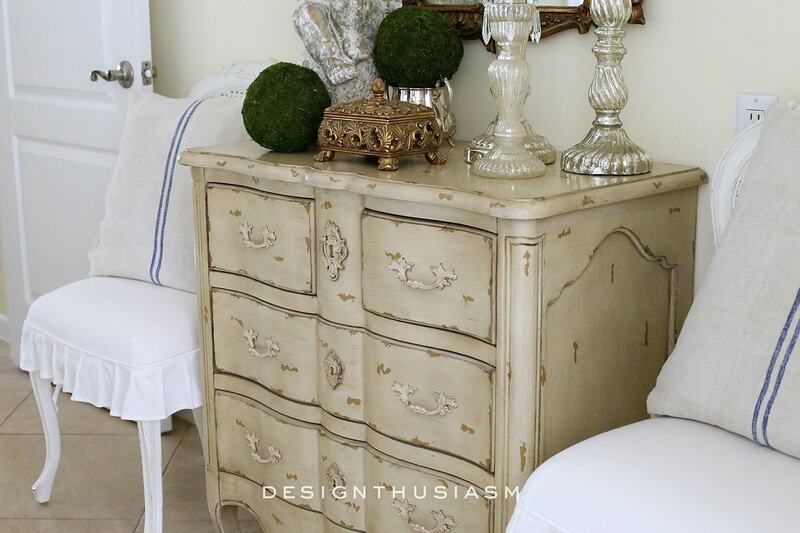 For Week 3, I began adding some decorative items, creating a vignette on the bureau. 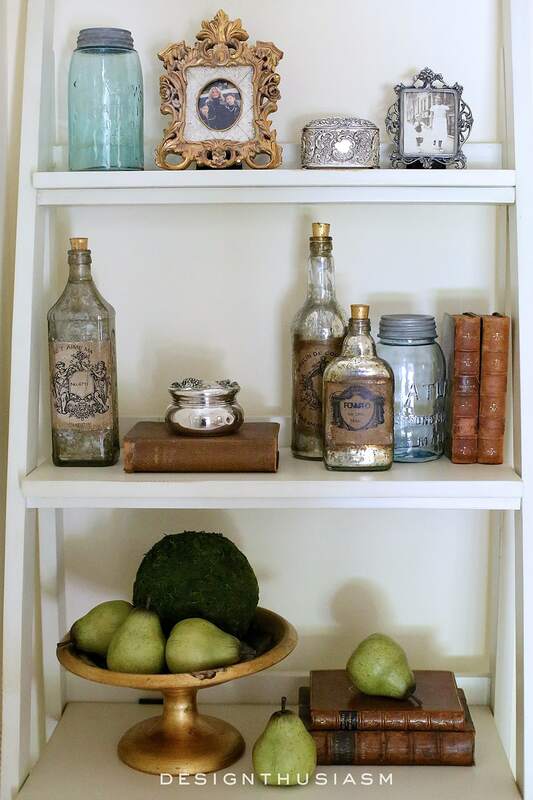 For Week 4, I began a new vintage collection to tuck into an empty corner. In Week 5, I added and styled a bookshelf on a separate wall across from the chairs. This week I took a good long look at the space and really analyzed what was missing to achieve the concept I wanted to convey. The essential character of the room is centered on its pale nearly neutral tones, a pretty French Country influence, a bit of gilded bling and a healthy dose of vintage. On that score, there were a few things I felt were missing. 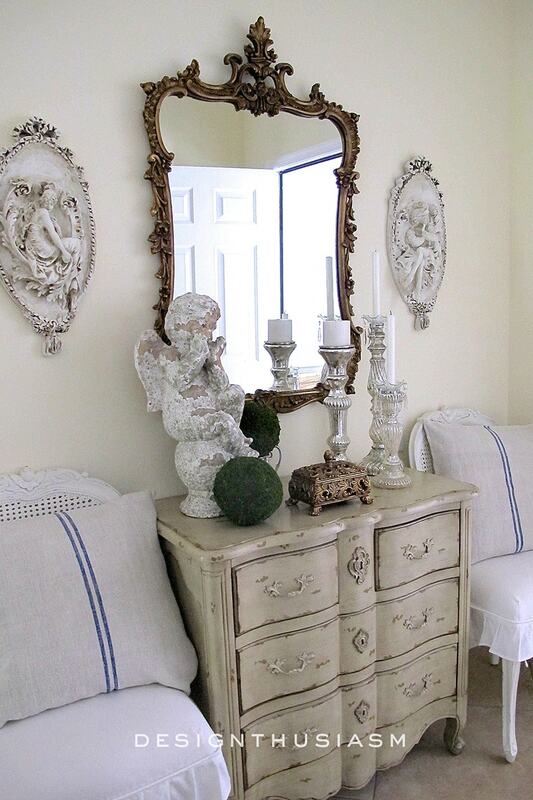 I love the chippy patina of the cherubic garden statue on the chest and I wanted to enhance this look with some additional pieces in the same feel. 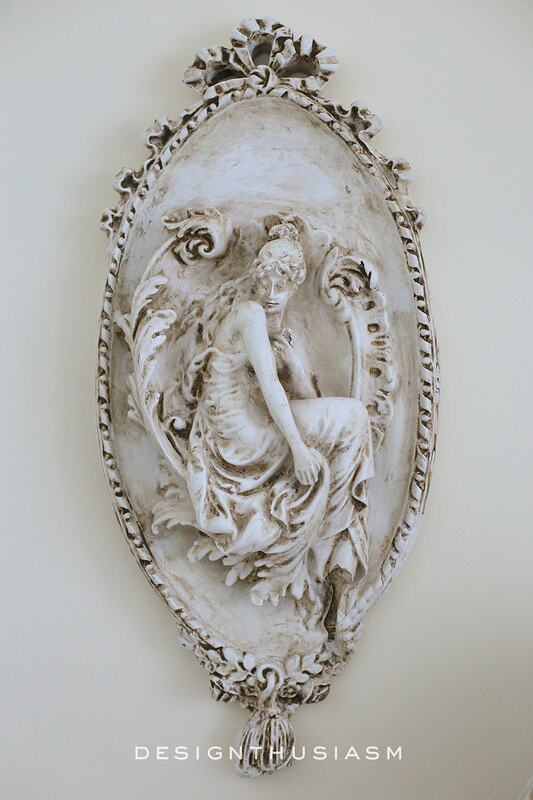 I found these wonderful vintage plaques at a local antique market and their oval shape related nicely with the curves of the gilded mirror. Another key addition was the inclusion of grain sack pillows. I felt the room was lacking in authentic vintage pieces and so I bought the burlap sack from a European online shop and when I received it I cut it in half and made two pillows from the cloth. 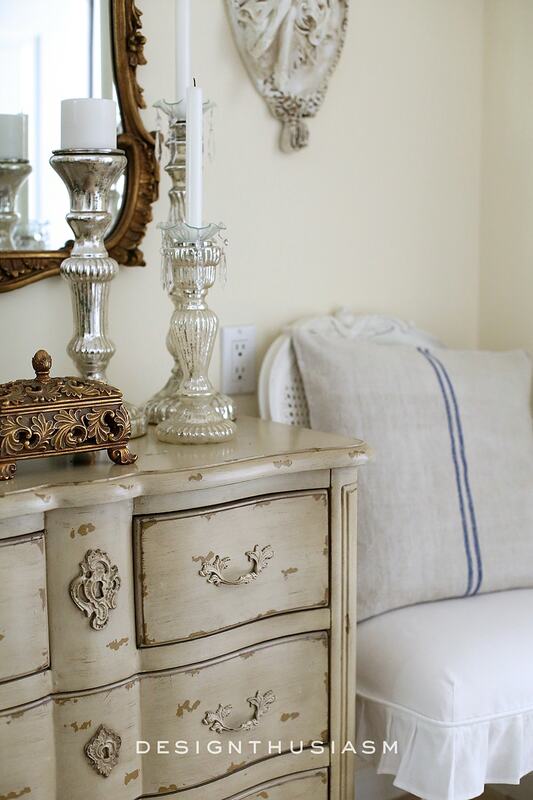 I really enjoy the casual tone the pillows add to the room. 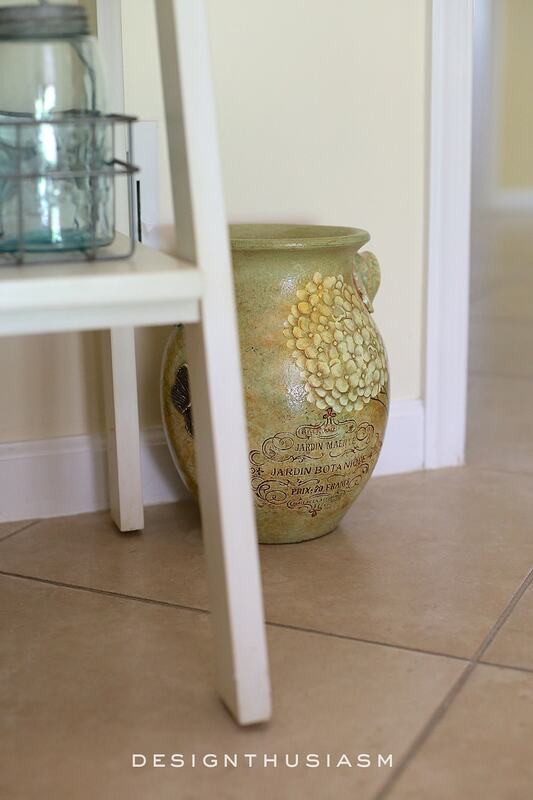 Our front entry is much more formal and serious, and I wanted the back to be more relaxed, albeit French and pretty. A quick check of the room confirms that most of my essential defining design elements (outlined in this post) are present and accounted for. I love the mix of patina with shimmer and I’ve got it well covered here. 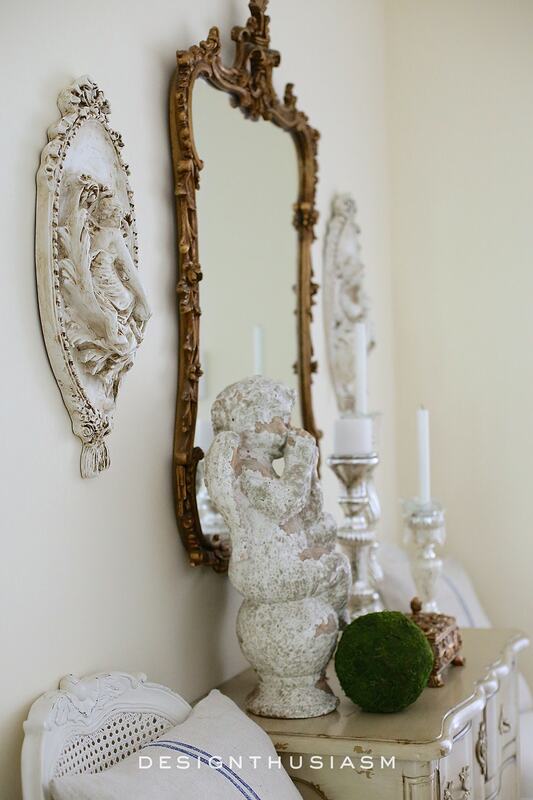 From mercury glass candlesticks to the gilded box and mirror, there’s plenty of gleam in the room to balance the worn and chippy finishes. 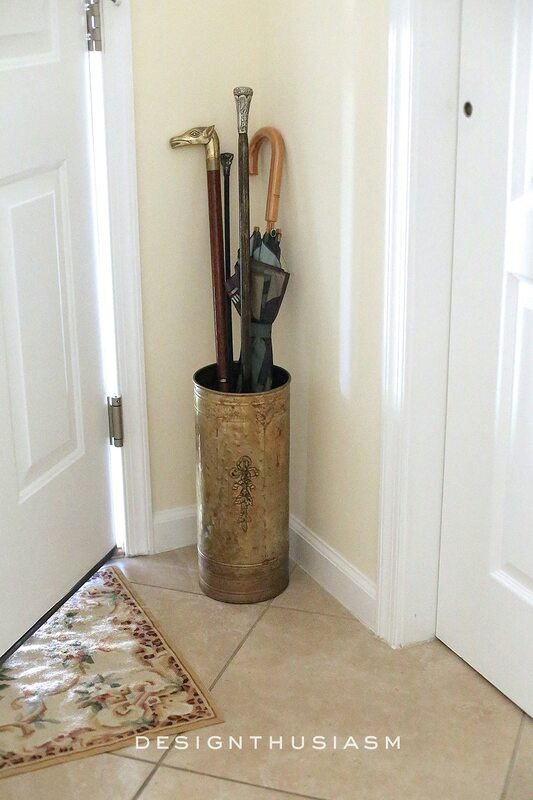 The vintage brass umbrella stand houses the beginnings of my new walking stick collection, introduced in my post a few weeks ago. 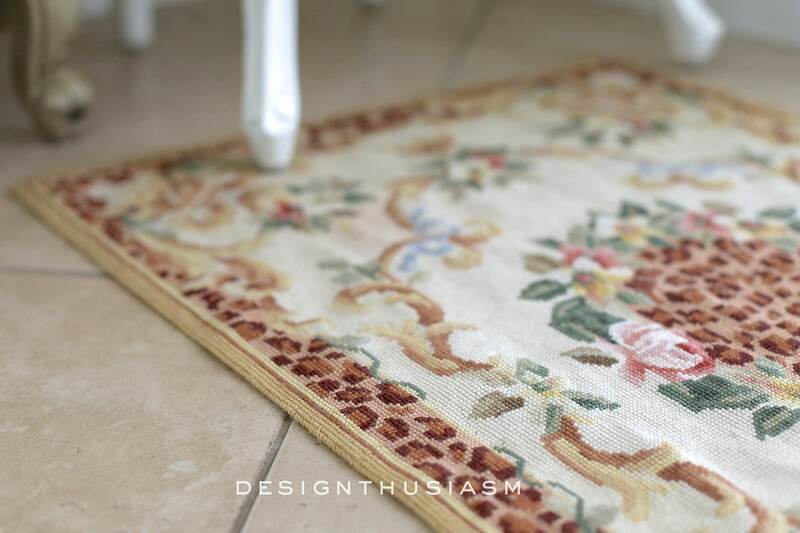 The needlepoint rug was added for interest while maintaining the character of the room. I would have loved to replace the tile floor, but that’s for another day. To give you a sense of where this space fits into the layout of our home, this view shows you a peek into the dining room. You can also glimpse the adjoining wall where the bookcase is situated. 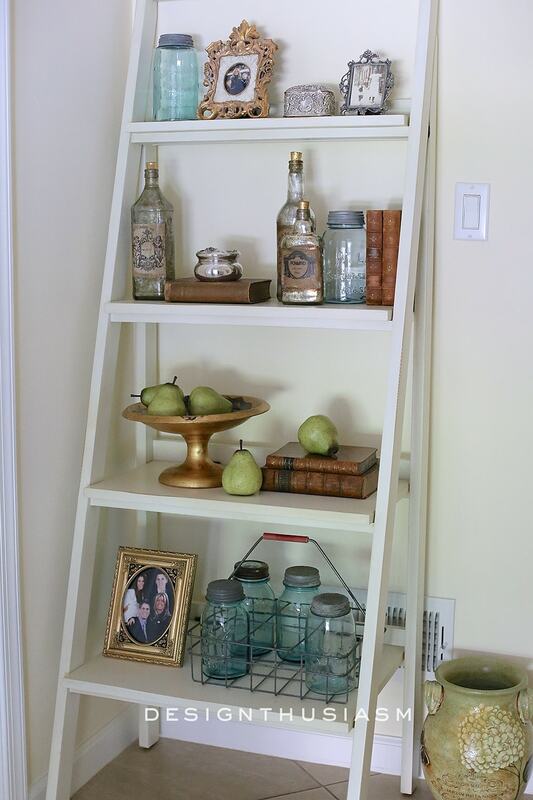 The shelves were styled in an earlier post and are chock full of vintage treasures. I previously tried a smaller vase here, but I prefer the larger one shown this week. The shot of subtle color works well with the feel of the general decor. 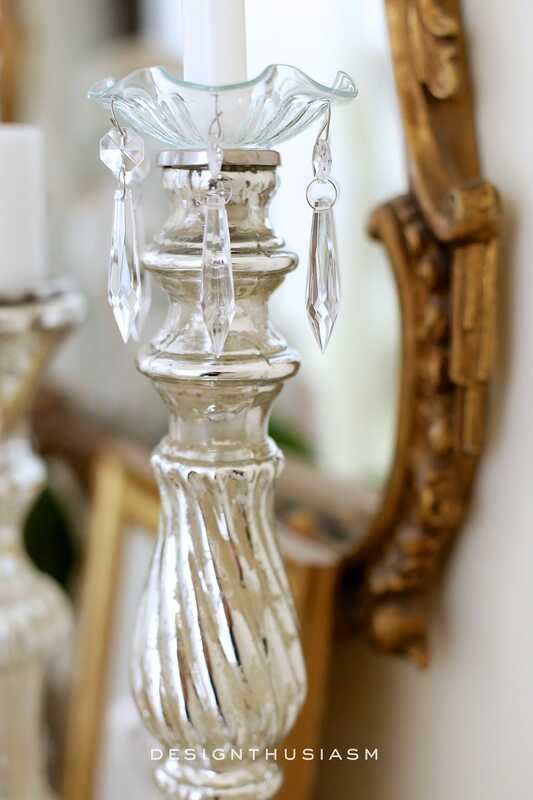 The final piece is the crystal chandy that presides over the entire room. And there you have the finished room, or as finished as it can be for now. 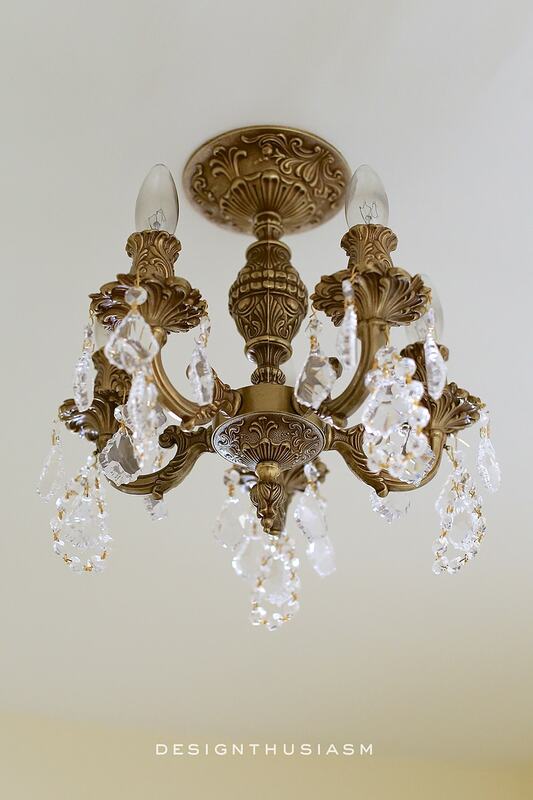 I do have further plans for the future that include a new floor, crown molding and larger chandelier. 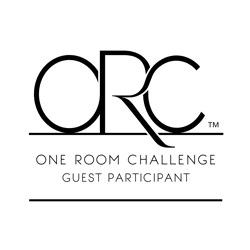 I thoroughly enjoyed participating in the One Room Challenge series and I want to thank Linda from Calling It Home for hosting us the past 6 weeks. Please enjoy the other entries at the link below as they are all presenting their final reveals today! Very pretty, well thought out and functional space. 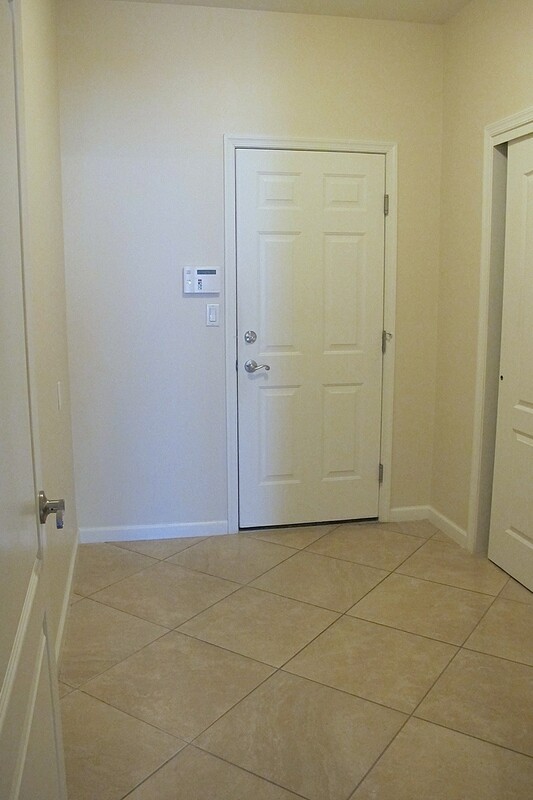 It really speaks to your decorating style. I so appreciate you participating in the challenge and doing a space that did not take on structural changes or construction. I am a pretty slow decorator and it is affirming to see a space evolve over the course of a couple of months. Really enjoyed following your progress and your informative posts on the process you use to achieve the final result. Thanks so much, Pamela!! I could never do structural in 6 weeks… lol!! Of course, I didn’t know about the challenge until the night before it started, so I made a very quick choice… 😉 So glad it resonated with you!! Your room makeover is lovely! I really appreciate you sharing the process with us, week-by-week. 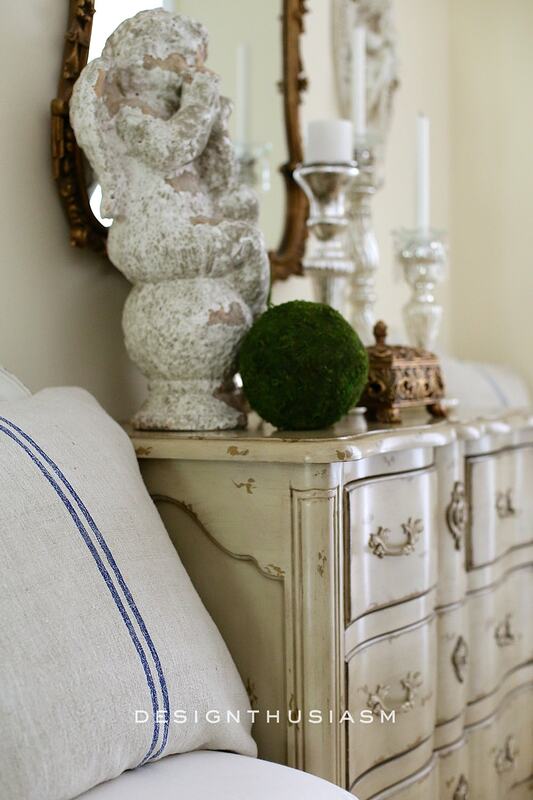 I love what I call “casual elegance” in room design. Just can’t get away from the bling but love the relaxed feeling of casual style. Congratulations on creating a design that will “make you smile” and inspire us! Thank you, Linda! I use the term casual elegance, as well! 🙂 It’s definitely what I’m going after, so I’m really glad it read that way. Thanks for visiting!! You have such a way with the details! So very pretty! 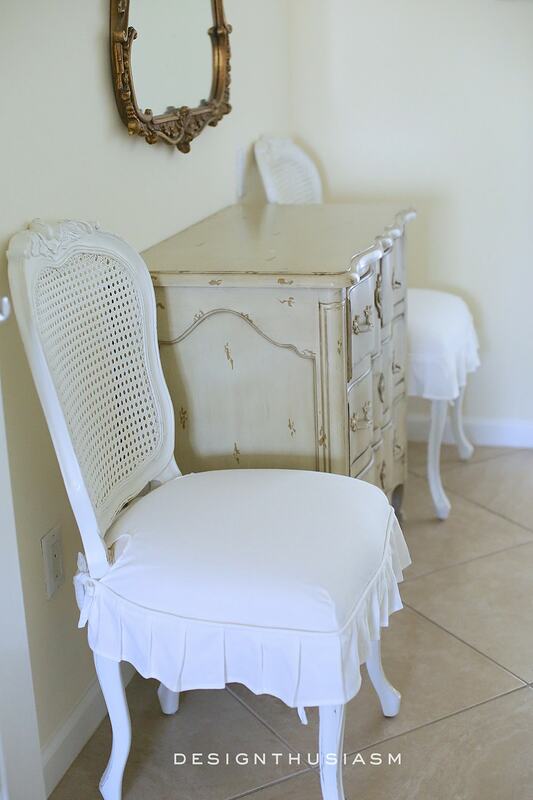 The chairs, chandelier, and accessories are to die for. I love it all! Way to go! Lory, your entry is just beautiful! I’m inlove with the mirror and how you styled around it!Congrats & CHEERS to us for another room done! Beautiful prelude to all the glam that lies beyond. I love your plaques! Those chairs are beautiful. Stunning room! Very pretty! I love that mirror! I love the results! And I just might find a couple of inspiration ideas here. It is so beautiful and a look that never goes out of style In love!! Looks beautiful Lory! 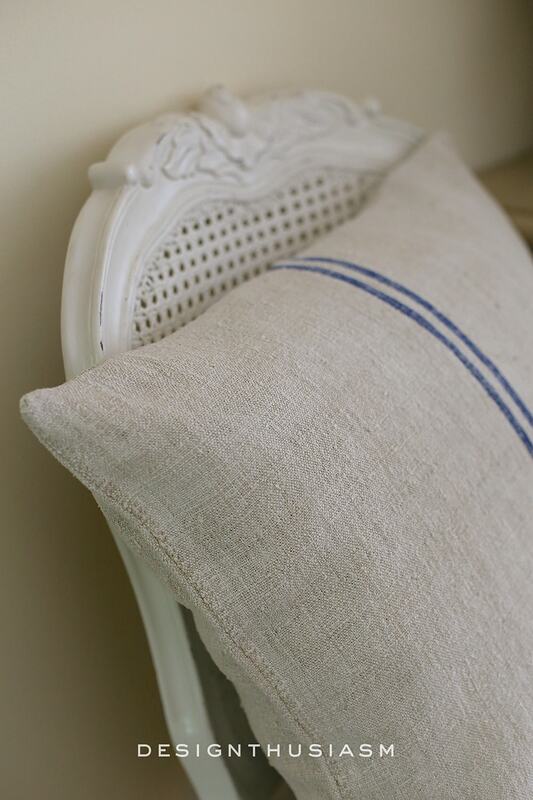 Love those grainsack pillows : ) Such stunning pieces in here! What a transformation and happy place whether leaving or arriving. I like that it continues the style of the rest of your lovely home in a less formal way. Lovely! 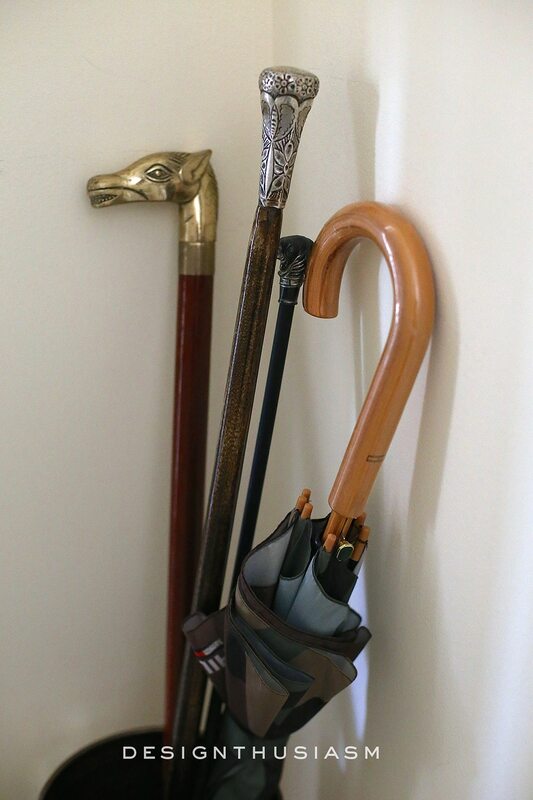 Love those walking sticks – what a great idea for a collection. 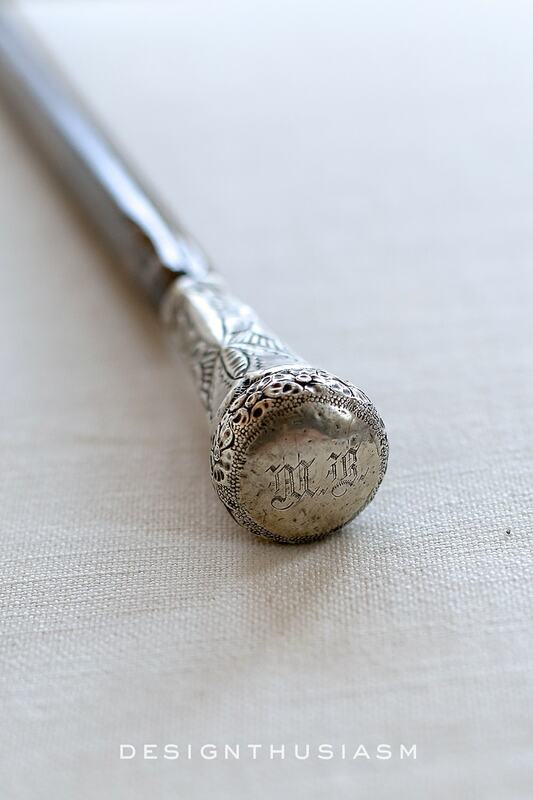 I just saw a couple at my local antiques mall ( I may have to go look at them again…). Very nice! What a pretty space. Beautifully done. 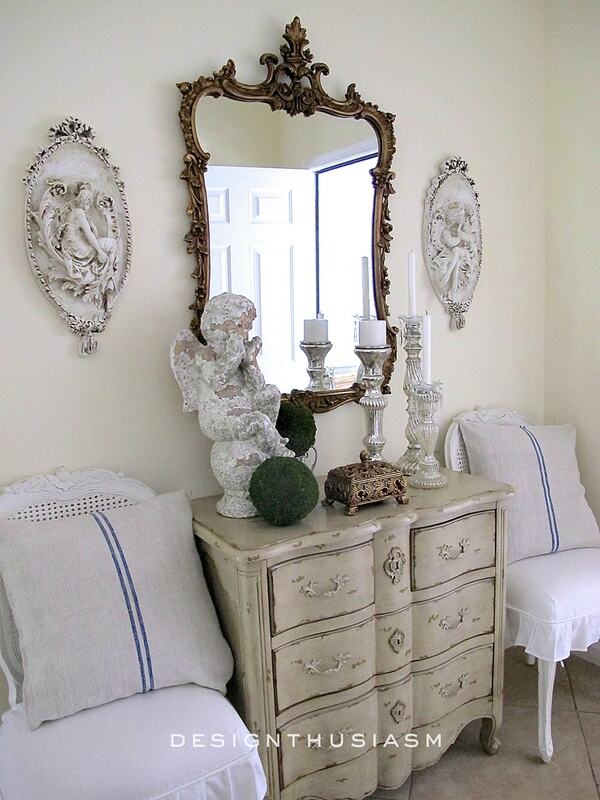 Love everything about this entryway. Beautifully done. Wow, that is beautiful Lory! Every detail adds to your overall French vintage look. 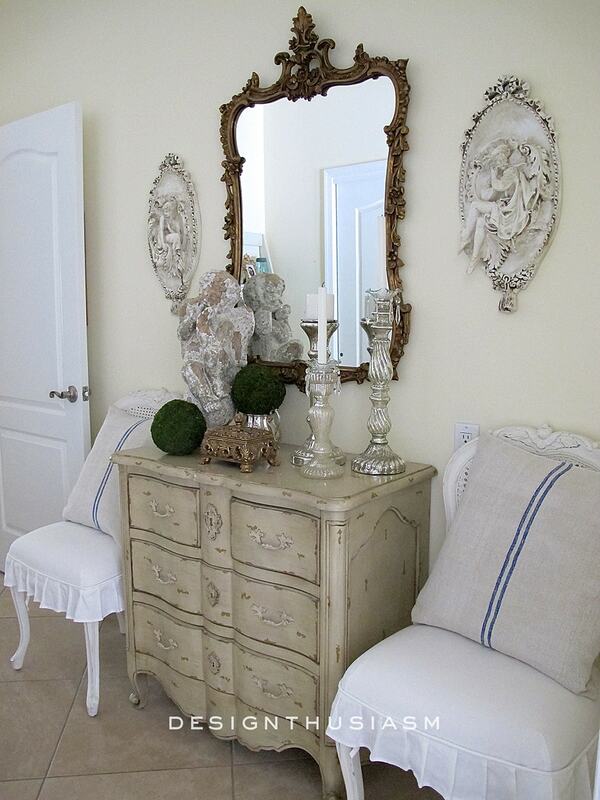 I love your chandy and the gold box, and the plaques….just everything! I need you to come do this in my house! 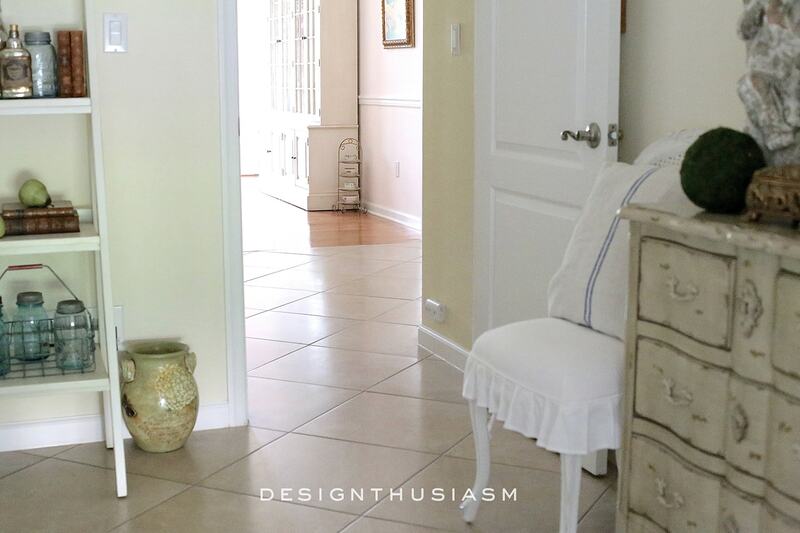 Beautiful job & well done…just a note: Don’t change the flooring…it really adds to the elegance of the room! Thanks so much! I was hoping to do marble, so it should still be elegant, but it will have to wait, so I’m glad you think this one looks nice… 🙂 Thanks for visiting!